NanoScreen services a wide variety of 96 and 384 channel dispense heads from 30µL to 1000µL. Our full service facility delivers the shortest turn-around time in the industry. A simple and comprehensive three-tiered service program ensures the head is returned in like new condition. We guarantee the head will meet or exceed O.E.M. specifications and provide the experimental accuracy, consistency and repeatability you demand. Don’t see your head type listed? Contact us for more information. The head will be disassembled, put through a 2-part wash and clean operation before all parts are inspected. All o-rings, seals, spacers and up to 10% of the piston and ball assemblies will be replaced. We will also replace any screws that are corroded or damaged. Finally the head will go through a burn-in process before being validated and boxed in a special shipping container before returning to you. All o-rings, seals, spacers, piston and ball assemblies and up to 10% of the mandrels will be replaced (if a mandrel style head). All o-rings, seals, spacers, piston and ball assemblies and mandrels or block will be replaced. 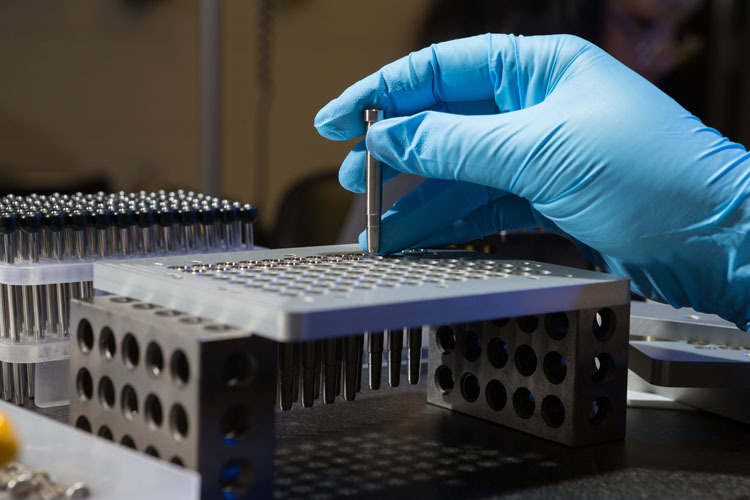 Our process for dispense head service ensures you get the experimental accuracy and precision you demand. Decontaminate the dispense head and send it to the service experts at NanoScreen along with a decontamination certificate. We offer special shipping kits at no additional cost. Contact us at team@nanoscreen.com and we’ll send one to you. Once we receive the head and decontamination certificate, we’ll perform a thorough evaluation. You will be notified of our recommended service (Level One, Level Two or Level Three) and request your approval to proceed with the service. Once we receive your approval, the head will be disassembled and all o-rings, seals and spacers removed. The head will be washed in a simple cleaning solution followed by an alcohol wash.
Every component will then go through a thorough inspection. Block style dispense heads are inspected under a microscope for any damage at their seal points. Mandrel style dispense heads are inspected by hand to check for any damage, deformity or seal point damage on the mandrels and pistons. Any parts that are damaged or deformed are replaced with in-house manufactured parts. Your dispense head is then re-assembled to a like-new condition. We then place the head on our burn-in machine to ensure that the pistons and mandrels are breaking in the seal point correctly. This burn-in process ensures the head performs like it should as soon as you put it back in use. Finally your dispense head will go through a series of tests to ensure it meets all specifications. It will also go through a validation test that includes a wick test, leak test, optical density test and accuracy test. Once validated, your dispense head is returned like-new with a Validation Certificate, parts we replaced and one year warranty.